This situation shows an ALLOGRAFT where a large part of the bone is removed from another area of the patient's own body and placed in the defect. In this situation the Block Autograft would most likely be from the patients hip bone (Iliac crest) due to the large size required. To avoid grafting and secondary surgical sites a severaly atrophied area can be made adequate for dental implant placement by changing the anatomy of the area. In this situation the lower limiting factor is the nerve. This means that we do not have a lot of bone to place implants because the nerve is in the way and therefore we cannot place an adequate size dental implant. But if we move the nerve out of the way, then there is adequate bone in the area to place the implant. This is a very delicate and complex procedure and not many dentists perform it. Also there is also a much higher risk of nerve damage with this procedure. In this situation we are again using the patient's own bone (Autograft) and securing the graft in place with the implants themselves. 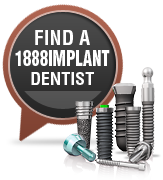 The implants are the items that are actually securing the graft to the grafted area. This procedure involves using an extender device. Basically a piece of bone is cut and held in place with a device that can be slowly extended. The area in between the two parts fills with bone and new bone height is created for dental implant placement. This is a technique that few dentists can perform but can have excellent results.